(First visited in April 2001 – last visited October 27th 2012) Han Song is not the most modern of bathhouses but being the third sauna I ever visited, the other two now closed, it has a special affection for me. It is directly next to the school I worked in when I was in Song-So in 2000 and 2003 and I wallowed in its water every afternoon for a year and from time to time, I still pay it a visit. It is a smallish sized bathhouse with friendly staff and fresh towels. I have a very sensitive nose and find not all towels smell fresh. I stopped using one gym because its towels smelt of marmite (similar to Australian ‘Vegemite’). In the bathhouse, the ceiling could do with a clean and some paint here and there and occasionally the drains are a little smelly. Apart from being a little old, Han-Song is clean and tidy. One of my favourite amenities here, and one which makes a visit worthwhile, is the salt sauna which has charcoal walls and small logs to sit on though you usually need to drape a towel over them as they can burn your backside.There is also a hot tub usually containing an enormous tea bag of green tea and the temperature is at the hot end for a hot tub. The changing room, open planned, is bright and clean with large lockers and central slatted benches. The rest area is again open planned with comfortable sofas and a television. There are also adjacent sleeping rooms. Very close to several apartment blocks, Han Song can get busy and it seems frequented by a clientele that are seriously into cleaning. I see much less lazing here and a lot more serious scrubbing with the Italy Towel. Times – Very early morning, around 5.30 – until 8 or 9 pm. Double check opening and closing times as they occasionally change. It is closed on Tuesdays. 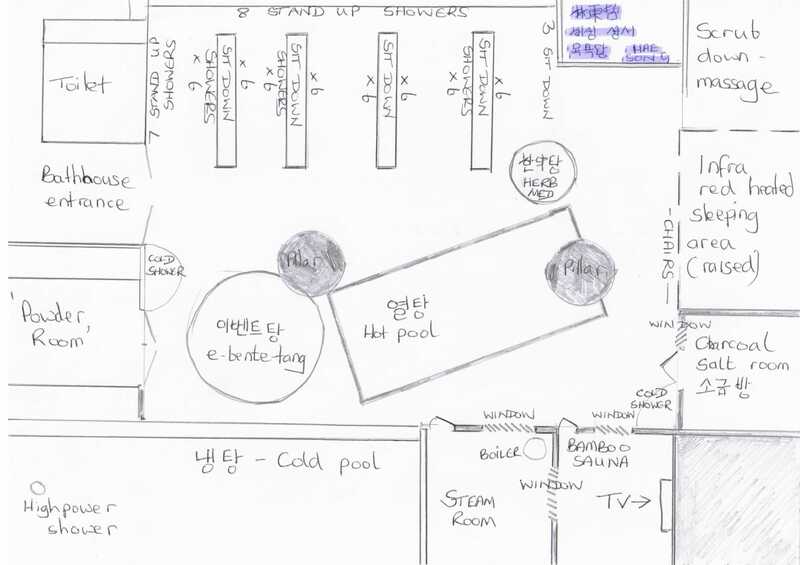 Bathhouse (men) – around 25 stand up shower facilities and around the same number of sitting down shower units, event pool, (이벤트탕) which is a jacuzzi, hot green tea pool ( 열탕), large cold pool (냉탕), larger jade bath (옥탕), jade steam room, bamboo sauna, salt room (소금방) with charcoal walls, sleeping area with infra-red heating and jade sauna, heated sleeping area. A television is located in the dry sauna. Other Amenities – Large relaxation area room (휴게실) with television and sofas. Sleeping room with blankets and wooden head rests. Hairdresser and shoe shine. A sports complex and bowling alley are in the same building. 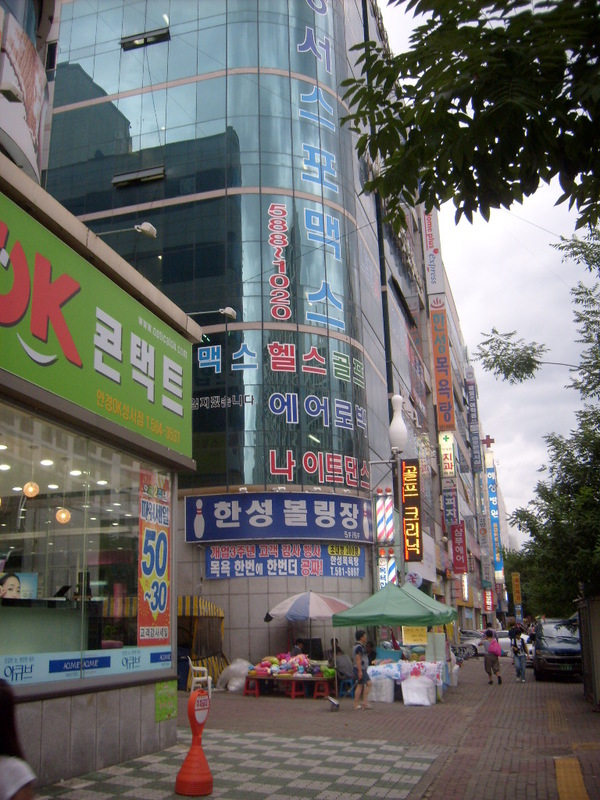 Cost – 4500 Won often free tickets given for future visits. Ambiance – relaxing when not busy. Mid-level lighting, could be cleaner but not unpleasant. Great for the salt room! Address – next to a Tesco, Home Plus convenience store. Waygukin – Over a 12-year period, I have only ever seen 2 westerners, an American boy and a Mexican student, both back in 2001. I did enjoy my visit here but I was unaware of the closing times and I think I overstayed my welcome a bit. We arrived just before 8pm but were asked to leave at 8:30 and the chap was a little grumpy. However, the bathhouse was enjoyable but I did find two of the main pools incredibly hot and I could only sit comfortably in the third, smaller pool. The cold pool was nice and big and I really enjoyed the salt room. Worth a visit but probably best to do it during the day! Around six is a good time as it is nice and quiet. Or early morning 5-6 am. On the Wikipedia map link you will see a Macdonalds close to the sauna. As if coming out the building turn towards the University, against the flow of traffic and walk straight ahead . After a few minutes, you will see a small Tesco Home Plus on your left hand side. Face the entrance to Home Plus and the entrance to Han-Seong is immediately on its left. The ticket office is on the third floor and the men’s bathhouse on the 4th floor. Good luck.